Some very clever marketing happened around the launch of a new Nando’s spicy chicken restaurant in Oshawa during the last week of March 2016 in anticipation of the venue’s April 1st Grand Opening. 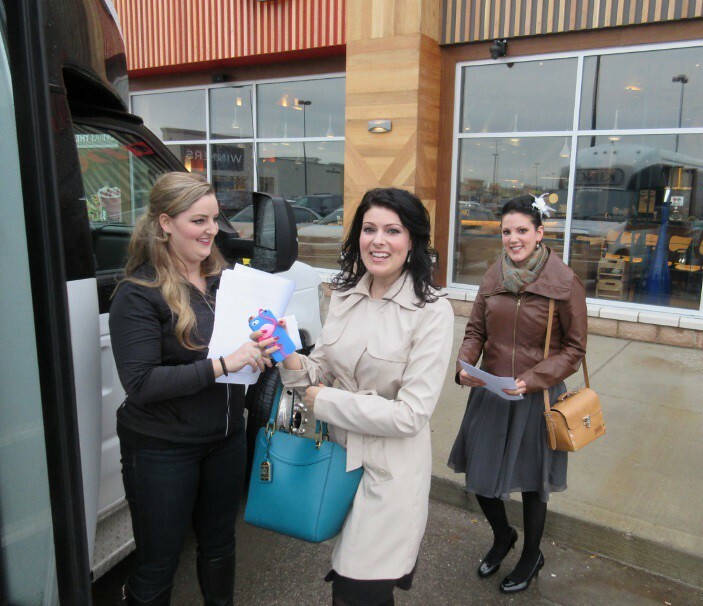 On two separate occasions, two dozen people met at 855 Taunton Rd in Oshawa at the site of the new Nando’s restaurant to board a tricked out tour bus called The Nandwagon. Once aboard, participants embarked on a forty minute ‘multi media journey of discovery’ through the Nando’s brand before physically arriving at another restaurant location somewhere in Ontario. The first expedition drove straight into the heart of Toronto to disembark passengers at the Nando’s restaurant at Bay and College. The second trip took a different crew to Nando’s Etobicoke restaurant location. The Nandwagon marketing concept was conceived and executed by Cummins & Partners, an award winning advertising agency known for their exceptionally creative solutions. Their Nandwagon concept and delivery is no exception. 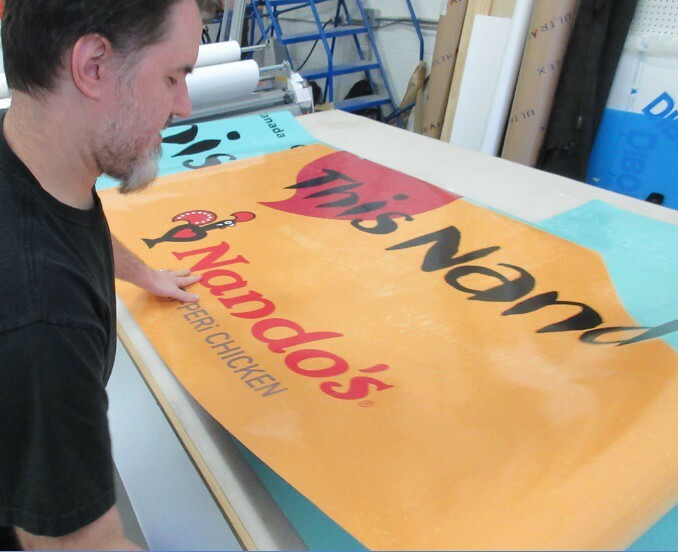 The account director rented a large tour bus and driver from King Charter which was then ‘vehicle wrapped’ at Combustion Studios with printed vinyl announcing Nando’s arrival in Oshawa. The address of the Oshawa location was printed right on the side of the Nandwagon. Vehicle wrapping is a great way for restaurants to tell a local community about their business. Did you know that an attractive vehicle wrap on a small car or pickup truck can make 30,000 impressions a day? It makes sense when you think about it; readers may wonder if the number is not actually higher? But now imagine how much greater the impression count would be for a huge tour bus. With this in mind, Nando’s Canada marketing department instructed the driver to spend the day cruising up and down Oshawa’s busiest streets before appearing at the restaurant at 6pm to pick up the Nandbassadors. 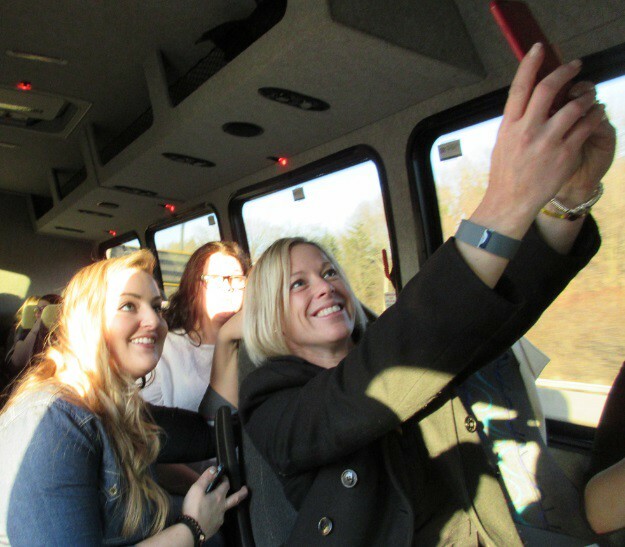 These special passengers were all influencers and ‘friends of the brand’ sourced from the Oshawa area through a clever social media contest outreach that was executed with help from Butter PR. They were mostly younger people, in their mid twenties and early thirties who were all active Facebook and Twitter users, and most also used Instagram and Pinterest. They all signed legal liability release forms granting the commercial use of their images for marketing purposes throughout the universe. The interior of the bus was set up to challenge riders with difficult trivia questions that required a mobile device and a Twitter account to answer. Thirty questions were prepared and approved by Nando’s Canada in advance along with prizing and #hashtags. Three administrators executed the program; a host and two assistants brought the game to life and selected winners. The first assistant was Rob Campbell from Surround who sat upfront beside Kiri, the bus driver and ran the monitor from his laptop. He was the self appointed Technical Director and worked to set up the necessary equipment which also included a portable (Rogers) WiFi device to better enable player’s phones to work while traveling. Alexandra Davies from Cummins & Partners kept her eyes on the Twitter feed to track the #nandostrivia results and select the winner of each question. 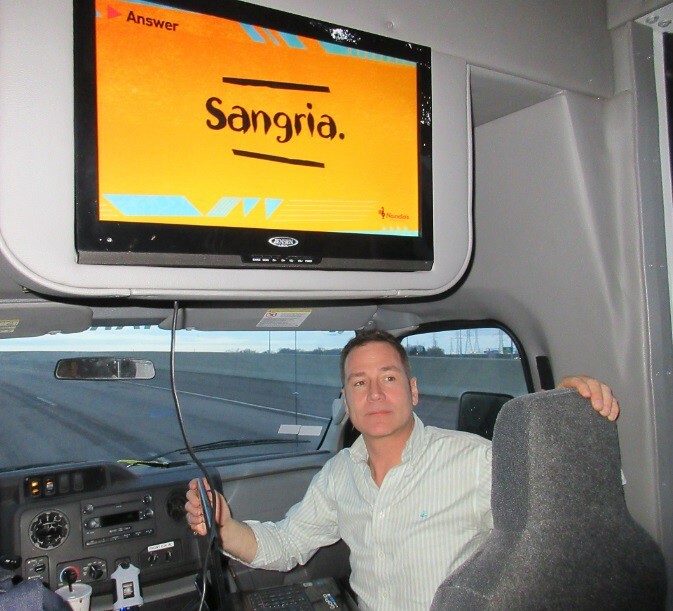 The bus’s own on-board monitor became the primary projection screen, and Krista from Nando’s Canada hosted the whole show as Trivia Master, reading the questions aloud to the twenty four players. She parked herself to the left of this screen and rocked the bus setting up the challenges, dispensing prizes, and telling intriguing brand stories as the answers were revealed. The game requires players use their phones to find solutions and then race to tweet the correct response plus the hashtag #NandosTrivia and #NandosOshawa. In this way the exercise propagates these hashtags throughout their friend circles in the Oshawa area. The trivia questions were as varied as they were difficult; they asked for specifics regarding the African Peri Peri spice trade, peculiar Nando’s origin story myths, and brand lore right up to queries detailing the new restaurant’s take-out menu items. Winners were given sauce bottles, coupons and gift cards for free meals at Nando’s right there on the Nandwagon. Nando’s Canada Twitter Trivia Game is the evolution of a Surround digital marketing solution called Cloud Warriors that was first attempted in a Mississauga wine bar in 2015. That game had two screens, one for the questions and another showed a Twitter wall. Nando’s Canada made the game even more mobile by putting the attraction on The Nandwagon and adding Alexandra as ‘Judge’ who would read and display an iPad showing the feed instead of rigging a second screen and Twitter wall display visible to all passengers. It was a compromise, but it worked. The #NandosTrivia Twitter game is the digital marketing evolution of a vehicle-wrapped bus, a physical branding device. The digital upgrade allowed occupants to experience a much more meaningful and memorable ‘brand journey’ and tell the world about it on Facebook and Twitter for real world rewards dispensed inside the vehicular arena. The statistics collected from TweetReach and displayed below illustrate how the initiative was able to impact the digital realm around Oshawa through the influencers’ Twitter streams. It does not calculate the any other platform. On the first night the game was played, 29 March 2016, the TweetReach on the #NandosTrivia hashtag was 13,000 Twitter impressions. The crew did much better the second night, 31 March 2016, because they were able to apply some learnings and switch the program around in some respects to better leverage their tools. The Host added a personal photography component by asking the Nandbassadores to tweet Selfies on the bus under the same #NandosTrivia hashtag. That way people following along outside in the real world could see the dimensions of what was happening inside the mobile arena. On that second night the mobile trivia game made just under 45,000 impressions as the Nandwagon traveled along the expressways to the Nando’s Etobicoke location on the other side of Toronto. The game was 40% longer and featured extra components including a live ‘dare double dare’ style Peri Peri sauce tasting which was also shared on Instagram and Facebook (and Periscope). In summary, the Nando’s Canada Twitter Trivia Game played on The Nandwagon on two separate expeditions ferrying 48 Nanbassadore in total, reached 14,000 Twitter accounts and impacted approximately 58,400 people on the platform. Additionally, the media made during the campaign can be further employed in branded content marketing initiatives not the least of which is making the trivia questions available to the public. Will this happen? Publishing the photos and videos of the event in social media channels can build links to Nando’s Canada website and the Oshawa location page. Nando’s Canada Twitter Trivia Game was a successful innovation that effectively enabled their Nandwagon branding device to impact locals in the digital realm and help spark the buzz that will ultimately ensure the restaurant’s success in the Oshawa fast casual dining marketplace.